Leading snooker players are in open revolt against their own governing body on the eve of the World Championship. They are unhappy with World Snooker about the deal it struck with online casino 888.com which has cost some of them personal sponsorship contracts. And coming on top of a drop in prize money, the issue has has led to many boycotting the media. "They are sick to death of the situation," Ian Doyle, chairman of agency 110sport, told BBC Sport. Doyle's company manages a dozen players competing at Sheffield including world number one Ronnie O'Sullivan, seven-time world champion Stephen Hendry and two other former world champions in Mark Williams and Ken Doherty. Hendry and Williams are both set to lose £50,000-plus sponsorship deals with Betfred, and Doherty his deal with Paddy Power. World Snooker rules prevent players from sporting logos from competing companies, and 888.com has signed a deal to be associate sponsors of the Masters, Grand Prix and UK Championship as well as sponsoring the World Championship. But it is the governing body itself, rather than 888.com, with whom the players are angry. The saga follows a large reduction in prize money in a season reduced to six ranking tournaments after Embassy was forced to withdraw its backing of the sport due to the ban on tobacco advertising last year. "We are talking about millions, not thousands," Doyle claimed. The cut in tournaments has seen many players suffer surprise upsets in the early rounds, complaining of a lack of quality match practice. "It doesn't seem to have hit home with the powers that be that these are the stars of the game," Doyle said. "Every sport needs it stars and these guys are being punished mercilessly. That, to me, is an absolute scandal." Doyle's company is contemplating legal action under European restraint of trade legislation. "If they choose to go down that route, that is their prerogative," Rodney Walker, chairman of World Snooker, the commercial arm of the game's governing body, told BBC Sport. 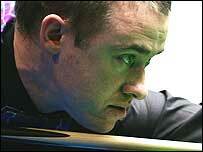 "But the rules of World Snooker are absolutely crystal clear. They are only allowed to have one sponsorship patch on their waistcoats. "For years it has been the practice that if an event was being sponsored by a tobacco company or a brewery, the players would not wear competing logos. "This is absolutely no different but some of the players are seeking to differentiate between what has gone before and what is happening now." Walker has already had discussions with two player agents and is due to meet representatives from 110sport next week. "We are fully aware of the situation and it doesn't affect that many players, nor is the amount of money they are affected by as dramatic as some of them might suggest," he said. "I am discussing the matter with 888.com and they are aware of the implications of the agreement. It is part of on-going discussions." Walker inherited what he called a "virtually bankrupt" sport in October 2003, turning round an organisation that made losses of £3m in the previous four years into one which made a profit of £1.2m in his first year. He anticipates "another good profit" this year, but admits players unwilling to promote the sport's showpiece tournament is "not ideal". "It is mainly one group of players that are not assisting in promoting the event, but thankfully there are plenty more players that are happy to do so. "Sometimes I am at a loss to understand what the players really want. "Yes, the prize money has reduced, as indeed the income has fallen dramatically as we have lost sponsorship income from tobacco. But we are going to replace that." Walker will announce the schedule for next season in June, when he expects there to be "more tournaments and more prize money". "The solution to the situation is for the sport to generate more income," he added. "We are beginning to do that and in those circumstances there will be more prize money and these issues will become less relevant. "Next year more tournaments and more prize money should begin to give the top players the income-earning potential they are seeking." Doyle however is yet to be convinced about the months ahead. "Sir Rodney has been a great disappointment," he added. "When he took the job he promised a radical overhaul but he has not changed things one bit."